If I ever again blog about buying anything, you're all allowed to shoot me. Ok, I'm sure I'll someday have to buy something, but the way I feel right now, after packing over 50 boxes of STUFF, I am so sick of it. It's actually kind of interesting to be forced to confront and actually handle the full physical mass of one's belongings. I don't even think of myself as having all that much stuff, but now I feel like I do. The books and CDs are ok-- it makes sense to me to collect those. The old notebooks and sketchbooks are fun to look at and will make my future biographers' lives so much easier. What really started to get to me was my clothes. I can't believe I have this big closet bursting with clothes, and yet I always wear the same few things. I found quite a lot of things to get rid of-- I've been getting more and more ruthless-- but it's still out of hand. The weird thing about my situation right now is that I have to put most of my stuff in storage for an undefined period of time. I'm assuming that it will be at least a month. If it goes too much longer than that, the weather will start to cool off and I'll need some fall clothes and shoes, but I can't access the storage location so I have to keep everything I think I'll need with me now. So part of my packing has been to segregate the stuff I think I can't live without for the next two months. This amounts to 2 suitcases, a duffel bag, and a laundry bag. Even this pared down, I have some clothes in there that I bet I'll never end up wearing. Other than that, I'm bringing some food I don't want to throw out, some cleaning supplies, my coffee mug, a bunch of toiletries, my laptop, some important documents like my passport and stuff to do with the condo, my iPod, a couple of books, a clock, a lamp, and my teddy bear. I'm sure there will be many times over the next month that I find myself wishing I had something that was in storage. But on the other hand, it seems like I will have a ton of stuff with me. I remember once seeing a photo essay in which families from around the world were photographed at home with all of their possessions. At one extreme, you had the Americans, shown in front of their large house, with TVs, appliances, sporting equipment, furniture galore, bikes, clothes, etc etc, all displayed on their front lawn. (I don't know who the hell would volunteer for that!) Then at the other extreme you had some third world family who owned the clothes they were wearing and a couple of bowls, and that was pretty much it. I'm glad I own more than just bowls, but at some points today while I was packing, I kept thinking it would be a blessing if the storage warehouse burned down and I lost everything. But I suppose I should be careful what I wish for! That reminds me that I have to figure out how much I want to insure all this stuff for. The replacement value of the books alone is probably over $5,000. But I got many of them for free. And some are now out of print and probably almost irreplaceable. Sometimes STUFF doesn't equal money. I just posted a follow-up to this piece. You might find it interesting! Speaking of books, did you consult any books/resources about homebuying when purchasing your condo? Are there any in particular that you'd recommend (or recommend avoiding)? Or, did you feel that books really wouldn't be much help in this area? I had a similar experience in the last couple of weeks. 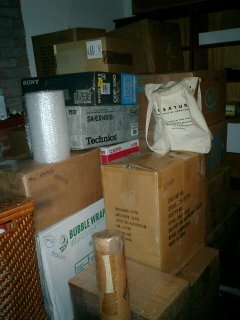 We gave away, threw away, or sold SO MUCH STUFF, yet we still ended up with a million boxes to clutter our new apartment. I plan to get rid of more of it when I am unpacking. Have we used it in the last year? Does it have enormous sentimental value? If the answer to both of those questions is no, it's gone. Even if the answer is yes (at least to the first question), it may still be gone. Couldn't agree with you more, stuff doesn't always equal money! 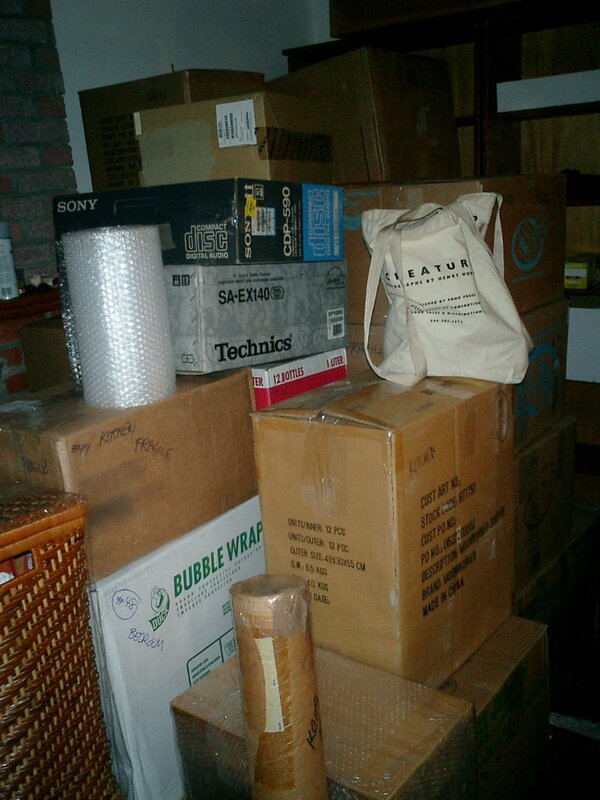 It always looks like more stuff packed than unpacked. I don't know why, but as a (now former) student that moved at least once a year since I was sixteen, it always seems like more when it's packed. There's always that moment when you've boxed half your stuff and stacked it in the corner and you realize that aside from the bookshelves looking a bit sparse, you can't tell the difference.